Early in his career, while working for KGMB-TV in Honolulu, Hawaii, he reported on a story that jarred his moral compass and changed his life forever. In his semi-autobiographical story, The Marrow in Me, Walsh recalls, with a profound array of emotions, a journey that took him from reporter of a story to becoming part of the story. In the process, Walsh’s story also took him to an unexpected place in which he ultimately addresses one of life’s eternal questions. Chris Pablo recently had been diagnosed with chronic myelogenous leukemia, when he decided to clear his head by hitting a bucket of golf balls at the driving range. While hitting balls, Pablo noticed a particularly battered ball. When he picked it up to see how this damaged range ball had ever made its way into his bucket, he noticed some writing that read: BEAT LEUKEMIA. With a young family at home, he saw it as a message from God. 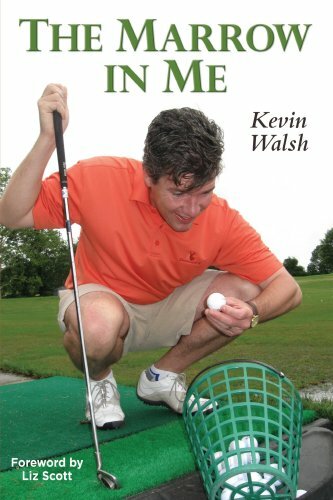 Walsh, an avid golfer, had read about the story of Pablo’s divine find and decided to pursue the story for his television newscast. From there, the story grew into a movement that created awareness and lead to media awareness about another young cancer patient, Alana Dung. Together with Pablo and Dung’s story, attention grew on the island that resulted in 30,000 islanders registering to become potential bone marrow donors, including storyteller Walsh. Walsh writes of the moral dilemma that plagued him as he covered this story. Walsh, the reporter, was one of the main forces behind this island movement. While he was an advocate for bone marrow testing, he was reluctant to undergo the process that could someday lead to a life-saving mission. On the final day of the registration drive, Walsh was tested and registered. Four years later, Walsh received a call that his bone marrow was a match for a 16-year-old cancer patient in need of the life-saving procedure. By the end of Walsh’s soul-baring, can’t-put-down story continues by chronicling his bone marrow operation and the process that lead to a life-saving transplant. Readers will feel the author’s pain as he returns to his former island home to run the Honolulu Marathon on behalf of the Leukemia & Lymphoma Society. And, if you were worn out after Walsh finished the marathon, you suddenly feel rejuvenated as Pablo presents the reporter with a dozen golf balls and a directive to go out and lose every one of them. The balls read: BEAT LEUKEMIA.